Biopsy-proven CAN was found in 62% of the Tac- and 72% of the CsA-treated patients within 2 years posttransplantation. Notably, 68% of the biopsy specimens with CAN were obtained from patients who developed CNI nephrotoxicity during the 1st year posttransplantation. In the short-term, CNI produces renal arteriolar vasoconstriction and a decrease in glomerular filtration rate (GFR) that is dose-related and reversible.,,,, Long-term exposure to CNI causes chronic nonreversible changes that are characterized by interstitial fibrosis and obliterative arteriolar changes due to fibrous intimal thickening. Nankivell et al. showed a histological evidence of CNI toxicity in all renal allografts within 10 years by adopting annual protocol biopsies. Such a long-term attrition effect of CNI is thought to contribute to the pathogenesis of chronic allograft damage despite the serum level being maintained within the therapeutic range. In order to avoid or even to ameliorate this effect, a variety of strategies has been explored. These include complete withdrawal of CNI at some point in the posttransplant period, substitution of CNI with mycophenolate mofetil (MMF), or simply minimizing the CsA maintenance dose.,,,, Although some success has been achieved with these strategies, withdrawal of CNI as late as 1 year posttransplant is often associated with acute rejection and the risk of late graft damage. Sirolimus (SRL) has been shown to be effective as a de novo therapy after renal transplantation  and as long-term maintenance therapy with steroids.,, It may also have a role as an effective substitute for CNI therapy late after transplantation to avoid further CNI nephrotoxicity.,,,,, However, the potential risk and benefit of this conversion strategy are not yet fully known, especially in the long-term. The aim of this study was to evaluate the safety and efficacy of conversion to SRL-based immunosuppression in stable kidney transplant recipients 6 months posttransplant. Patients selected for the study were low-risk kidney transplants between January 2005 and October 2009 receiving Tac-based maintenance treatment and followed-up at our center. They were invited to participate in the study after signing an informed consent. The characteristics of the patients are outlined in [Table 1]. Inclusion criteria were: first transplant patients aged >21 years old; serum creatinine levels < 1.5 mg/dl; no past history of acute antibody mediated rejection or recent acute cellular rejection 3 months before randomization; unsensitized patients; and had baseline total serum cholesterol < 200 mg/dl, triglycerides < 160 mg/dl, total white blood cell (WBCs) count of more than 3000; platelet counts of more than 100,000; and/or willingness to participate in the study. This was a randomized, parallel-group, prospective study comparing continued triple therapy with Tac (Prograf, Fujisawa Healthcare, Al Hekma Inc. Amman, Jordan), corticosteroids and MMF (Tac group; control), with withdrawal of Tac, and addition of SRL (Rapamune, Wyeth-Ayerst Philadelphia, USA) (SRL group). The 6-month time point was chosen to minimize the risk of early acute rejection. Patients were randomly assigned to one of the two treatment groups (1:1) using a computer generated sequence after obtaining informed, written consent for participation in the study [Figure 1]. The study was undertaken in accordance with the Declaration of Helsinki and all subsequent amendments and was approved by the Local Ethics Committees. All patients in both groups received 20 mg basiliximab (Simulect, Novartis Basel, Switzerland) intravenously at surgery and on day 4 postoperatively. Patients in both groups received 500 mg of intravenous (IV) methyl prednisolone on the day of surgery. Oral prednisolone was then given at a dose of 1 mg/kg/day, and then gradually tapered down to 5 mg/day by the 3rd month posttransplantation. Tac was started at a dose of 0.075 mg/kg/day in two divided doses targeting a 12 h whole blood trough level of 10–15 ng/ml in the first 3 months and then from 3 to 7 ng/ml thereafter. Concomitant immunosuppression and other treatments (i.e., MMF) (Cellcept, Hoffmann-La Roche, Basel, Switzerland) were mandatory at a minimum of 500 mg twice daily and the maximum dose not to exceed 750 mg twice daily. Steroid therapy remained unchanged all over the observation period. After randomization, patients were either to discontinue Tac and start SRL at once (SRL group) or to continue treatment with Tac (Tac group). In SRL group, SRL was initiated by giving SRL loading dose of 5 mg/day for 7 days then, 24 h blood trough level was measured and the dose of SRL was adjusted to maintain target trough serum levels of 4–7 ng/ml. Scheduled visits were at weekly for 1 month, monthly for 3 months, and then every 3 months until the end of the study. At each visit, there was a complete clinical examination, a recording of vital signs, an assessment of parameters including hematological (hemoglobin, WBCs, and platelet count), biochemistry (serum creatinine, serum cholesterol, and liver function tests), calculated GFR according to the Cockroft–Gault formula, and SRL and Tac trough levels according to the standard techniques. Clinical assessment: The patients were assessed clinically with particular emphasis on blood pressure measurement. Clinical tolerance to the given medications was assessed, which included the safety profile and the occurrence of any adverse events. A patient was considered hypertensive if blood pressure exceeds 140/90 mmHg. The number of antihypertensive drugs was reported for every patient to express the severity of hypertension. Diabetes was defined as two random blood sugar values ≥200 mg/dl and/or fasting blood sugar values ≥126 mg/dl, taken on separate occasions as per the WHO guidelines. The efficacy endpoints were patient and graft survival, renal function, and the incidence and severity of biopsy-proven acute rejection (BPAR) according to the Banff criteria. The safety evaluation was based on the incidence of adverse events and change in laboratory parameters (hematological and biochemical). Graft loss was defined as death with functioning graft or a return to long-term dialysis. Withdrawal from the study was defined as stoppage of Tac or SRL drugs. After at least 36 months of follow-up or patient loss or withdrawal from the study. All data were evaluated using SPSS for Windows Version 20 (SPSS Inc., Chicago, IL, USA). Actuarial patient and graft survival were calculated according to the Kaplan–Meier method, comparisons were performed by log-rank analysis. T-test was used to compare between the two groups in continuous data. Chi-square was used to compare categorical variables. Principal analysis was undertaken using an intention to treat approach. For all the above tests, P < 0.05 was considered as significant. Entry and participant flow through the study are shown in [Figure 1]. A total of 124 patients were recruited, of whom 38 proceeded beyond randomization. Forty-one patients refused to participate, and 16 were excluded for reasons other than those specified in the inclusion criteria, including relocation, undergoing investigation for co-morbidity, and delayed decision until after study closure. 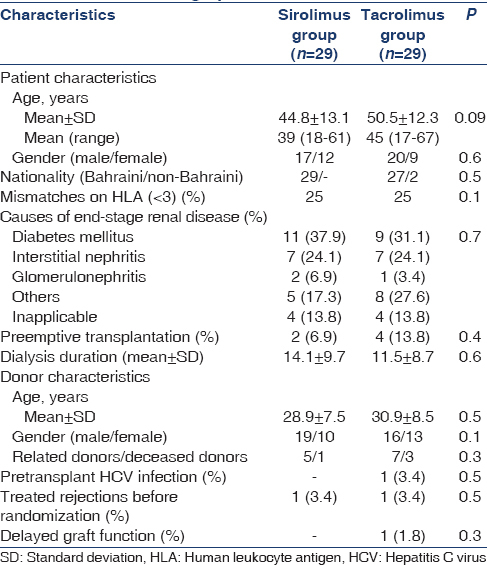 Baseline demographic, transplant-related, and clinical data of the randomized patients are presented in [Table 1] and [Table 2]. No differences in either demographic or transplant data were observed between the two groups. No between-group differences were found as regards clinical and laboratory parameters as shown in [Table 2]. All patients in both groups completed the 3-year follow-up and were included in the final intention-to-treat analysis. At 1-year postrandomization, 26 (89.7%) patients in the SRL group and 28 (96.6%) patients in the Tac group were still receiving the initially allocated study drug. Afterward, SRL was discontinued in further 3 (10.3%) patients and Tac in further 2 (6.9%) patients. In the two groups, the primary reason for discontinuing Tac or SRL was the occurrence of adverse events. The majority of adverse events occurred in the SRL group during the 1st year. All patients in the two groups were treated with MMF and corticosteroids at 3 years posttransplant with no between-group differences as regards their doses. At 1 year after conversion, the mean Tac trough level was 4.7 ± 1.5 ng/ml, while the mean SRL trough level was 4.5 ± 1.3 ng/ml. At 36 months, there was no significant difference in mean MMF (1.6 ± 0.4 vs. 1.6 ± 0.3 g/day) and steroid doses (5.0 ± 0.5 vs. 5.0 ± 0.3 mg/day) in the SRL and Tac groups, respectively. Moreover, the mean therapeutic level of SRL (7.0 ± 2.3 ng/ml) in SRL group and mean Tac level (7.2 ± 2.1 ng/ml) in Tac group was in the therapeutic window. During the follow-up, 4 (13.8%) patients in the SRL group and 3 (10.3%) in the Tac group (P = 0.5) developed BPAR. The median time to the first acute rejection was 20.3 months in the SRL group and 23.1 months in the Tac group (P = 0.19), and one patient in the Tac group developed two acute rejection episodes. In SRL group, one developed chronic antibody-mediated rejection with no response to therapeutic treatment including methyl prednisolone pulses in addition to IV immunoglobulin plus plasmapheresis session followed by four doses of rituximab therapy over 4 weeks and the patient returned to dialysis. 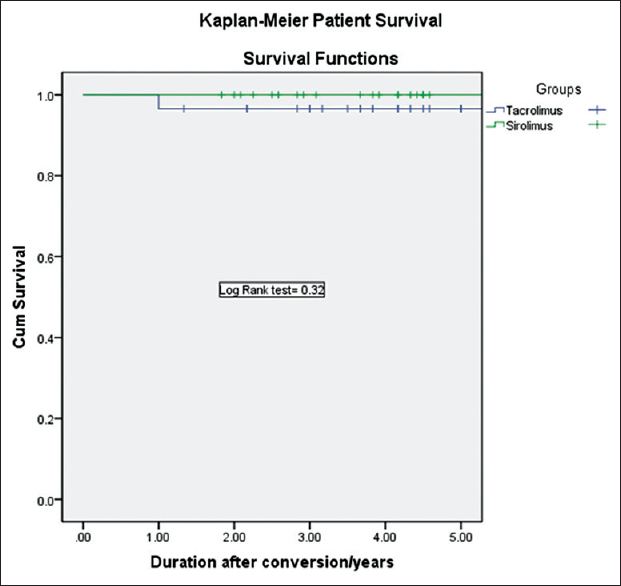 Patient survival at 3-years was 93.1% in the SRL group and 100% in the Tac group (P = 0.32) [Figure 2] and [Figure 3]. Two patients died between 1 and 3 years in the SRL group, death was due to a brain tumor (n = 1) and cerebral stroke (n = 1). 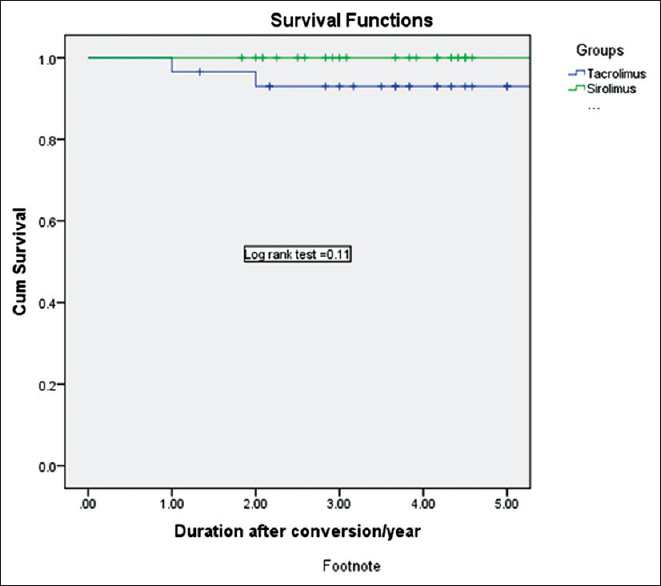 Censored death graft survival at 3-years was 89.7% in the SRL group and 100% in the Tac group (P = 0.11). Three graft losses in the SRL were reported between 1 and 3 years due to death with functioning graft (n = 2) and chronic antibody-mediated graft rejection (n = 1). During the 3-year observation period, GFR decreased in the Tac group (from 73.2 ± 8.3 to 71.3 ± 13.6 ml/min 1.73 m 2, P = 0.07) and increased in the SRL group (from 72.8 ± 7.1 to 74.2 ± 7.5 ml/min 1.73 m 2, P = 0.06); comparison analysis showed a significantly different 3-year changes in GFR in the two groups [Table 3]. Urinary protein excretion rate increased in the SRL group (from 0.1 ± 0.1 to 0.7 ± 0.5 g/24 h, P = 0.001), whereas nonsignificant changes were observed in the Tac group (from 0.1 ± 0.1 to 0.2 ± 0.3 g/24 h, P = 0.1). In the SRL group, 6 (23%) patients developed de novo proteinuria after conversion with a median value 1.2 g/day, 2 (7.6%) of whom were at a nephrotic level, therefore, SRL was stopped and Tac was reintroduced in these two patients. In the Tac group, 2 (7.4%) patients developed de novo proteinuria after conversion with a median value 0.4 g/day, none of them were at a nephrotic level. At the start of the study, the mean systolic blood pressure (128 ± 16 mmHg and 129 ± 17 mmHg; P = 0.2) and diastolic blood pressure (77 ± 13 mmHg and 81 ± 13 mmHg; P = 0.3) in the SRL and Tac groups, respectively, was not significantly different. Most of the patients in both groups were controlled with one to two drugs (20 patients, and 22 patients in Tac and SRL groups, respectively) with a mean number of drugs, 1.5 ± 0.7 and 1.4 ± 0.7 in Tac and SRL groups, respectively. At 12 month, the mean systolic blood pressure (130 ± 15 mmHg and 138 ± 19 mmHg; P = 0.03) and diastolic blood pressure (73 ± 11 mmHg and 80 ± 12 mmHg; P = 0.04) in the SRL and Tac groups, respectively. At 36 month, the mean systolic blood pressure (132 ± 19 and 141 ± 21 mmHg; P = 0.001) and diastolic blood pressure (74 ± 14 mmHg and 82 ± 10 mmHg; P = 0.001) in the SRL and Tac groups, respectively. At 36 month, 44% and 30% of the patients were not taking anti-hypertensive medications in the SRL group and the Tac group, respectively, (P = 0.02 [Table 4] and 17 patients in Tac group versus 5 patients in SRL group were controlled more than two drugs with a mean number of drugs, 2.3 ± 0.5 and 1.1 ± 0.6 in Tac and SRL groups, respectively). Before randomization, the blood cholesterol (224 ± 38 and 220 ± 23 mg/dl; P = 0.1) and triglycerides (141.6 ± 70.8 mg/dl and 150.4 ± 70.8 mg/dl; P = 0.5) were not significantly different in the SRL and Tac groups, respectively. At 12 months, the mean serum cholesterol level was 224 ± 38 mg/dl versus 181 ± 19 mg/dl (P = 0.02), and at 36 months, 226 mg/dl versus 192 mg/dl (P = 0.01) in the SRL and the Tac group, respectively. At 12 months, the mean serum triglyceride level was 204 ± 53 mg/dl versus to 159 ± 53 mg/dl (P = 0.01) and at 36 months, 221 ± 53 mg/dl versus 142 ± 44 mg/dl (P = 0.01), in the SRL and the Tac group, respectively. At 36 months, the mean serum cholesterol (236 ± 19 mg/dl) and triglyceride (177 ± 27 mg/dl) levels increased significantly in the SRL group, compared to TAC group (212 ± 27 mg/dl) and (142 ± 27 mg/dl) (P < 0.05) and 24% of the patients in the Tac group, and 58% of the patients in the SRL group were taking lipid-lowering medications (P < 0.0001) [Table 3] and [Table 4]. Mean hemoglobin concentrations were similar between groups at baseline [Table 2] significantly different from 12 months (11.9 and 12.7 g/dl, P = 0.02) to 36 months (11.4 and 12.3 g%, P = 0.01), in the SRL and Tac groups, respectively. Erythropoietic drug use was similar at baseline 4.7% and 4.8%, increased to 12.7% versus 5.6% in the SRL and Tac groups, respectively, at 36 months. The total leucocyte count fell significantly at 12 months in patients on SRL (P = 0.04) and at 36 months (P = 0.01). There was no significant difference in the change of platelet count between groups at either time point. There were 11 cases of posttransplant diabetes mellitus in the Tac group (37.9%) and 10 in the SRL group (34.5%) (P = 0.3). There was one case of polyomavirus infection in the Tac group. One case of posttransplant malignancy (brain tumor) was diagnosed in the SRL group. One case of systemic cytomegalovirus infection in the SRL group and one case of H1N1 virus infection in the Tac group were diagnosed during the study period. Other cases which required admissions were two cases of pneumonia in each group. Other adverse events were shown in [Table 4]. SRL was discontinued in six patients in SRL group (20.7%; pregnancy, acute humoral rejection, and heavy proteinuria) versus in three patients in Tac group (10.3%; chronic interstitial fibrosis in two and polyoma virus nephropathy in one; P = 0.2). Prolonging renal allograft survival remains one of the most important challenges in kidney transplantation. Indeed, long-term kidney transplant survival rates have not kept pace with the striking improvements achieved in short-term outcomes. A major cause of long-term allograft injury, fibrosis and functional decline, is CNI toxicity. This study examines the safety and efficacy of converting patients with a stable renal function from Tac-based regimen to an SRL-based regimen after kidney transplantation. In our study, we found the incidence of BPAR was 13.8% in SRL group and 10.3% in Tac group patients (P = 0.5). Most of the patients in both groups experienced one rejection episode. However, in SRL group, one developed chronic antibody-mediated rejection with no response to therapeutic modalities and patient returned back to dialysis. A previous meta-analysis of mammalian target of rapamycin inhibitor (mTORi) use in kidney transplant recipients had been shown no difference in acute rejection and superior graft function when SRL are used as CNI replacement. In a study, on conversion of CsA to everolimus at 4.5 months posttransplant found that the incidence of BPAR from randomization to month 36 was significantly higher in the everolimus group 13% versus 4.8% in the CsA arm, P = 0.015. On the other hand, Lebranchu et al. although they noticed a similar pattern of BPAR after SRL conversion, however, two graft losses due to acute rejection were observed in the SRL group during the 1st year of the follow-up period. However, although, they found no difference in the incidence of de novo or persistent anti-human leukocyte antigen antibodies between the groups; 12.3% of patients in the SRL group and 21.1% in the CsA group, they concluded that SRL may expose to the risk of graft loss due to resistant acute rejection. Our results show that the rates of graft loss (including death with a functioning graft) were significantly higher in the SRL group, despite improved graft function in those surviving with functioning grafts. Two patients died between 1 and 3 years in the SRL group; death was due to brain tumor and cerebral stroke. Results from large registry database analyses  suggest that Tac/SRL- or SRL/MMF-based immunosuppression may be inferior to Tac/MMF-based immunosuppression in long-term graft survival. In symphony study, it was found that allograft survival differed significantly among the four groups (P = 0.02) and was highest in the low-dose Tac group (94.2%), followed by the low-dose CsA group (93.1%), the standard-dose CsA group (89.3%), and the low-dose SRL group (89.3%). In a recent large UNOS-based observational study of 139,370 kidney transplant patients, de novo use of mTORi was associated with increased allograft loss and mortality throughout 8 years of longitudinal follow-up. The higher incidence of allograft loss may be due to the increased rate of acute rejection seen with mTORi and the known association of acute rejection with allograft loss. Interestingly, in this study, that mortality did not correlate with acute rejection suggesting a mechanism independent of effect on allograft function. This phenomenon was also observed in a prior observational investigation of Hungarian allograft recipients, in which mTORi were associated with increased mortality, but not worse allograft outcomes. Further studies are needed to firmly establish this association and the responsible mechanism for high mortality among these patients. However, in spare the nephron study, they found better graft and patient survival after 2 years of follow-up of their patients and explained this for lower incidence of acute rejection (9.5% and 11.3% in MMF/SRL group and MMF/CNI group, respectively), and fewer deaths in the SRL group. Compared to our results, it may be explained by the shorter period of follow-up, the higher number of patients allocated and the multicenter nature of the study design. Estimation of renal allograft function by calculated GFR revealed a better renal function in group SRL patients as compared to Tac patients at most time points. This finding came in accordance with what had been previously reported by Lebranchu et al. and Weir et al. that CNI-free regimens based on SRL have better renal function than CNI-based regimens. In the Spare the Nephron study, they found at 1 year, the mean percentage change in directly measured GFR was greater in the SRL arm (24.4 vs. 5.2%; P = 0.054), but this benefit was no longer evident at 2 years. The evidence suggests that in patients without markedly compromised kidney function or proteinuria, conversion from a CNI to mTORi may preserve GFR, but offers no definitive benefit on the hard outcomes of mortality or allograft loss. In our study, as observed at the end of the follow-up observational period, urinary protein was higher in the SRL group. Severe proteinuria was not frequent (7.6%) but may have resulted in the reconversion to CNI in these cases. Thus, the small increase in protein excretion was considered clinically acceptable, especially in the presence of the improved GFR values in the SRL group. However, in view of indications that early low-grade proteinuria may predict subsequent graft loss, urinary protein excretion should be carefully monitoring during the long-term follow-up of these patients. The decrease in blood pressure in the SRL group versus Tac controls has potentially more advantages on patient and graft survival. The avoidance of CNI with the use of SRL may allow more effective long-term blood pressure control. The profile of adverse events reported here in the SRL group was as expected, including the effect on lipid profile, diabetes mellitus, and hematological values. Cholesterol levels requiring statin therapy were significantly higher in SRL group, as shown in the present trial. SRL has been observed to elevate blood lipids in almost all clinical trials, and the dyslipidemic effect appears to be dose-related. Hyperglycemia has been reported in more than a third of patients on SRL and Tac. CNI therapy is well-known to increase the rate of new-onset diabetes after kidney transplantation, and in few small, single-center studies have suggested that SRL may have a diabetogenic effect. In one retrospective analysis, the authors showed that SRL is associated with a similar risk of diabetes compared to Tac. There was a significant increased incidence of anemia and the percentage of patients receiving erythropoietin in the SRL groups. Augustine et al. reported a prevalence of anemia of 31% in patients on Tac-based compared with 57% on SRL-based therapy in renal transplant patients at 1 year post-transplantation. Some limitations must be acknowledged in our study. First of all, it was a single-center study with a small sample size (n = 58) and also the relatively short observation period which may lighten the sound of conclusions. The fundamental rationale for SRL conversion is the potential for improved long-term outcome, measured over decades, with respect to proteinuria, renal function, and graft survival. Second, some methodological factors should be taken into account in the interpretation of this study including statistical power which is needed to estimate the total sample size needed based on the expected outcome in each group. Moreover, we did not include protocol biopsy to assess chronic allograft damage index in our study which may have some benefits in diagnosing histopathological changes in grafts over time. Our experience demonstrates that conversion to SRL from CNI-based therapy may result in better renal function and blood pressure control in renal transplant recipients without an increased risk of acute rejection but was associated with higher discontinuation rate attributable to adverse events. However, these benefits have not resulted in a growing advantage in graft or patient survival. Solez K, Vincenti F, Filo RS. Histopathologic findings from 2-year protocol biopsies from a U.S. multicenter kidney transplant trial comparing tarolimus versus cyclosporine: A report of the FK506 Kidney Transplant Study Group. Transplantation 1998;66:1736-40. Meier-Kriesche HU, Li S, Gruessner RW, Fung JJ, Bustami RT, Barr ML, et al. Immunosuppression: Evolution in practice and trends, 1994-2004. Am J Transplant 2006;6(5 Pt 2):1111-31. Shihab FS. Cyclosporine nephropathy: Pathophysiology and clinical impact. Semin Nephrol 1996;16:536-47. Halloran PF. Immunosuppressive drugs for kidney transplantation. N Engl J Med 2004;351:2715-29. Morales JM, Andres A, Rengel M, Rodicio JL. 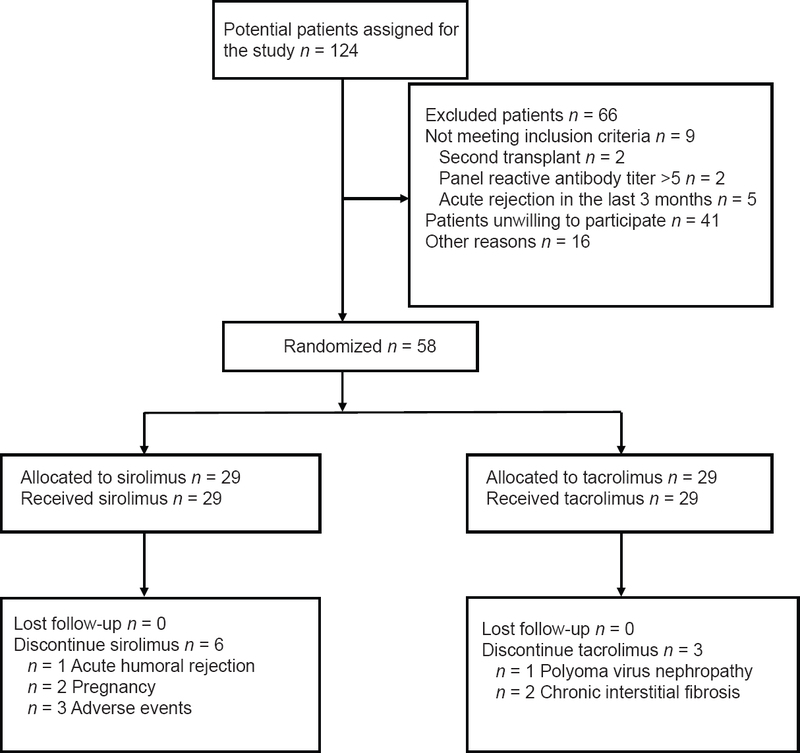 Influence of cyclosporin, tacrolimus and rapamycin on renal function and arterial hypertension after renal transplantation. Nephrol Dial Transplant 2001;16 Suppl 1:121-4. Morales JM. Immunosuppressive treatment and progression of histologic lesions in kidney allografts. Kidney Int 2005;68:S124-30. Nankivell BJ, Borrows RJ, Fung CL, O'Connell PJ, Chapman JR, Allen RD. Calcineurin inhibitor nephrotoxicity: Longitudinal assessment by protocol histology. Transplantation 2004;78:557-65. Kasiske BL, Chakkera HA, Louis TA, Ma JZ. A meta-analysis of immunosuppression withdrawal trials in renal transplantation. J Am Soc Nephrol 2000;11:1910-7. MacPhee IA, Bradley JA, Briggs JD, Junor BJ, MacPherson SG, McMillan MA, et al. Long-term outcome of a prospective randomized trial of conversion from cyclosporine to azathioprine treatment one year after renal transplantation. Transplantation 1998;66:1186-92. Ducloux D, Fournier V, Bresson-Vautrin C, Rebibou JM, Billerey C, Saint-Hillier Y, et al. Mycophenolate mofetil in renal transplant recipients with cyclosporine-associated nephrotoxicity: A preliminary report. Transplantation 1998;65:1504-6. Weir MR, Mulgaonkar S, Chan L, Shidban H, Waid TH, Preston D, et al. Mycophenolate mofetil-based immunosuppression with sirolimus in renal transplantation: A randomized, controlled spare-the-nephron trial. Kidney Int 2011;79:897-907. Afzali B, Shah S, Chowdhury P, O'sullivan H, Taylor J, Goldsmith D. Low-dose mycophenolate mofetil is an effective and safe treatment to permit phased reduction in calcineurin inhibitors in chronic allograft nephropathy. Transplantation 2005;79:304-9. Ekberg H, Tedesco-Silva H, Demirbas A, Vítko S, Nashan B, Gürkan A, et al. Reduced exposure to calcineurin inhibitors in renal transplantation. N Engl J Med 2007;357:2562-75. Hamdy AF, El-Agroudy AE, Bakr MA, Mostafa A, El-Baz M, El-Shahawy el-M, et al. 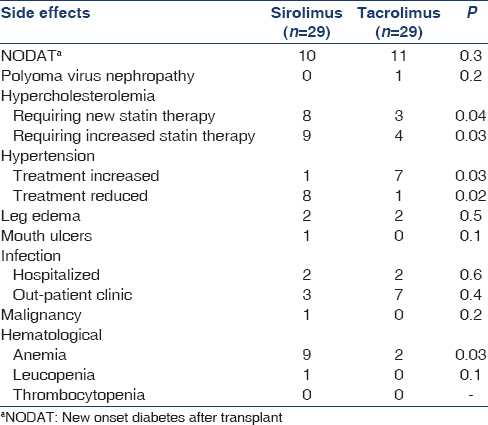 Comparison of sirolimus with low-dose tacrolimus versus sirolimus-based calcineurin inhibitor-free regimen in live donor renal transplantation. Am J Transplant 2005;5:2531-8. Vincenti F, Ramos E, Brattstrom C, Cho S, Ekberg H, Grinyo J, et al. Multicenter trial exploring calcineurin inhibitors avoidance in renal transplantation. Transplantation 2001;71:1282-7. Soliman K, Mogadam E, Laftavi M, Patel S, Feng L, Said M, et al. Long-term outcomes following sirolimus conversion after renal transplantation. Immunol Invest 2014;43:819-28. Srinivas TR, Schold JD, Guerra G, Eagan A, Bucci CM, Meier-Kriesche HU. Mycophenolate mofetil/sirolimus compared to other common immunosuppressive regimens in kidney transplantation. Am J Transplant 2007;7:586-94. Yan HL, Zong HT, Cui YS, Li N, Zhang Y. Calcineurin inhibitor avoidance and withdrawal for kidney transplantation: A systematic review and meta-analysis of randomized controlled trials. Transplant Proc 2014;46:1302-13. Lai WJ, Chiang YJ, Chen Y, Chu SH. Is sirolimus a safe alternative to reduce or eliminate calcineurin inhibitors in chronic allograft nephropathy in kidney transplantation? Transplant Proc 2004;36:2056-7. Mulgaonkar S, Kaufman DB. Conversion from calcineurin inhibitor-based immunosuppression to mammalian target of rapamycin inhibitors or belatacept in renal transplant recipients. Clin Transplant 2014;28:1209-24. Abramowicz D, Hadaya K, Hazzan M, Broeders N, Hoang AD, Ghisdal L, et al. Conversion to sirolimus for chronic renal allograft dysfunction: Risk factors for graft loss and severe side effects. Nephrol Dial Transplant 2008;23:3727-9. Diekmann F, Budde K, Oppenheimer F, Fritsche L, Neumayer HH, Campistol JM. Predictors of success in conversion from calcineurin inhibitor to sirolimus in chronic allograft dysfunction. Am J Transplant 2004;4:1869-75. Meier-Kriesche HU, Schold JD, Srinivas TR, Kaplan B. Lack of improvement in renal allograft survival despite a marked decrease in acute rejection rates over the most recent era. Am J Transplant 2004;4:378-83. Flechner SM, Goldfarb D, Solez K, Modlin CS, Mastroianni B, Savas K, et al. Kidney transplantation with sirolimus and mycophenolate mofetil-based immunosuppression: 5-year results of a randomized prospective trial compared to calcineurin inhibitor drugs. Transplantation 2007;83:883-92. Schena FP, Pascoe MD, Alberu J, del Carmen Rial M, Oberbauer R, Brennan DC, et al. Conversion from calcineurin inhibitors to sirolimus maintenance therapy in renal allograft recipients: 24-month efficacy and safety results from the CONVERT trial. Transplantation 2009;87:233-42. Flechner SM, Glyda M, Cockfield S, Grinyó J, Legendre CH, Russ G, et al. The ORION study: Comparison of two sirolimus-based regimens versus tacrolimus and mycophenolate mofetil in renal allograft recipients. Am J Transplant 2011;11:1633-44. Webster AC, Lee VW, Chapman JR, Craig JC. Target of rapamycin inhibitors (sirolimus and everolimus) for primary immunosuppression of kidney transplant recipients: A systematic review and meta-analysis of randomized trials. Transplantation 2006;81:1234-48. Lebranchu Y, Thierry A, Thervet E, Büchler M, Etienne I, Westeel PF, et al. Efficacy and safety of early cyclosporine conversion to sirolimus with continued MMF-four-year results of the postconcept study. Am J Transplant 2011;11:1665-75. Isakova T, Xie H, Messinger S, Cortazar F, Scialla JJ, Guerra G, et al. Inhibitors of mTOR and risks of allograft failure and mortality in kidney transplantation. Am J Transplant 2013;13:100-10. Cortazar F, Molnar MZ, Isakova T, Czira ME, Kovesdy CP, Roth D, et al. Clinical outcomes in kidney transplant recipients receiving long-term therapy with inhibitors of the mammalian target of rapamycin. Am J Transplant 2012;12:379-87. Halimi JM, Laouad I, Buchler M, Al-Najjar A, Chatelet V, Houssaini TS, et al. Early low-grade proteinuria: Causes, short-term evolution and long-term consequences in renal transplantation. Am J Transplant 2005;5:2281-8. Verhave J, Boucher A, Dandavino R, Collette S, Senécal L, Hebert MJ, et al. The incidence, management, and evolution of rapamycin-related side effects in kidney transplant recipients. Clin Transplant 2014;28:616-22. Roland M, Gatault P, Doute C, Büchler M, Al-Najjar A, Barbet C, et al. Immunosuppressive medications, clinical and metabolic parameters in new-onset diabetes mellitus after kidney transplantation. Transpl Int 2008;21:523-30. Augustine JJ, Knauss TC, Schulak JA, Bodziak KA, Siegel C, Hricik DE. Comparative effects of sirolimus and mycophenolate mofetil on erythropoiesis in kidney transplant patients. Am J Transplant 2004;4:2001-6.